Okay UPLAND NATION, time to get your hands greasy and your heads into a creative place. Let’s trick this truck. Budget? Nah. The world is our oyster, at least for the moment, when it comes to customizing this rig. gesso on every canvas, then starts splashing on the colors … lots of them. Like her blank canvas, this rig is white. Now the fun begins. 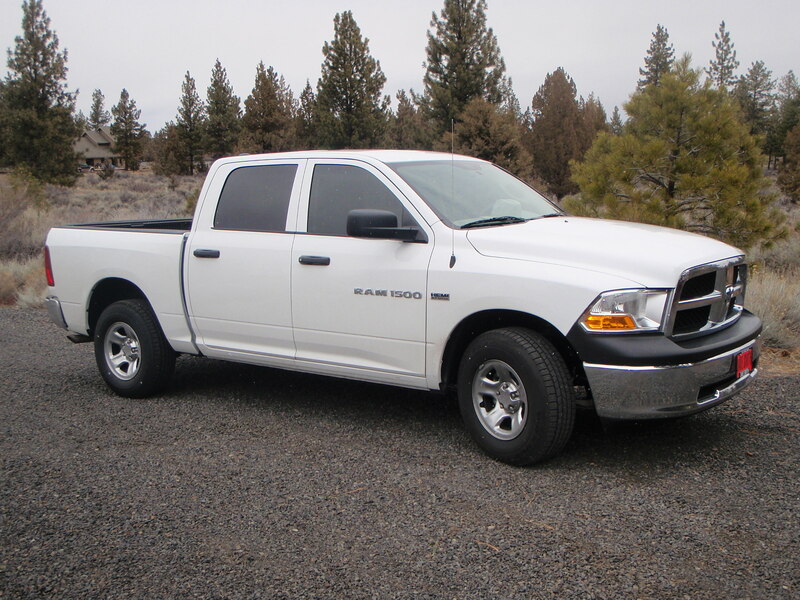 It’s a 2011 Dodge Ram (yes, that thing has a hemi), half-ton chassis, crew cab. Besides your great personalized license plate suggestions, what would you put on, pull behind, stack up, or otherwise do to this truck to make it the ultimate bird hunting rig? Practical, sure. Just plain cool stuff? You bet. What do you wish you’d spec’d out on yours? What have you seen that is now on your wish list? You make the suggestions. Then I’ll start making the calls. We’ll all see the results next year on Wingshooting USA. I know I am little late to this topic, and many of the items that I baked into my last two rigs are already mentioned. I’ve always looked at this to accommodate 1. Dogs and gear, 2. Hunter and gear. For the dogs…I have a custom 3-dog box under a cab-hi topper on my 08-Dodge 1/2 ton crew cab. I built a floor riser (10″) for the bed, so I have storage underneath – no drawers and lockable tail-gate. The space is large enough underneath to accommodate bird boxes for training. The topper is lined/insulated. I am looking at putting a top-vent on the topper with a powered fan for cooling, in addition to the flow-thru circulation of topper window to the cab and side windows. I am too short to consider a boat rack on the topper. For the hunter, the only thing I would recommend over the items already listed would be putting in hanger points under the topper to hang vests, jackets, chaps etc. that can get damp. These are options you can order with most toppers. This has worked well for me. Just about there on the canopy, Scott, and going in your direction. Already have the TruckVault (pix soon), exploring canopy options now. Where is your dog box located? Along the back of the bed against the cab? Love your fan idea. My 3-dog box (plastic, custom sized/built in SW MN) is located with the back of the dog box against the cab of the truck (NOT flush with the tailgate). My floor riser is primitive – 2×10 (3) joists with a three-quarter plywood top. I have a rubber bed-mat on top of that. (I do have a full plastic bedliner as a base, too. ). I have eye-bolts at the base of the dog box for secure tie-down to the D-rings inside the truck-bed. I had a local canvas shop make a custom insulated cover for the dog-box, also. I am in MN, so it can get pretty cold for the dogs in the winter. It works great. Another suggestion I would have is if you go with a topper that retains your tail-gate, make sure you get a locking latch for your tail-gate (option on the Dodge, but also plenty of after-market). Not expensive, but very handy. I just saw your new post on the new truck vault. Very cool. I went with a plastic dog box – cooler in the summer and warmer in the winter. I could send you more info on it, if you would like. Thanks Scott. Many of your ideas are similar to mine … maybe slightly different means, or materials, but most of us have the same needs. More to report soon. Of course you need a fantastic new in-vehicle storage system from TruckVault! Wait…you and Manny were just here yesterday! Great seeing you Scott! Visit again soon. Thanks for your hospitality, Don. Hey everyone, stay tuned for the whole story. The “NATION MOBIL”! Kind of catchy. Hey Scott, How about some up dates for the upland nation mobil ? We want to see the transformation as it goes. WHAT BUDGET? Now were talking, Are yo looking for a camper for the truck or a topper? You said you want to be able to stand up in it, and be able to pull an RV? Wow that’s a tall order for a half ton. Unless you want one of the pop up off road ATV tent trailers with the front deck to haul an ATV or the way I see them a front deck to be able to sit on and have a table and chairs like the beverly hillbillies, Then you would be styling in the out back. HUNT HARD AND HUNT SAFE! Oh ya sorry for carring on but when your looking at trailers only look for two axles , single and you will hate it from the time you pull it to the casa. Boy, do I remember my old trailers – you are absolutely right! Lets not forget the ranch hand bull bar and winch for those other guys that get stuck on the trail with you in the field ! That “HEMI” will pull a 20 ft RV fine , But I’d bet that’s more than your after.Definitely custom graphic of BUDDY and MANNY one on ether side [these new decal wraps are cool] .Most definitely a high top topper for best gun vault and dog kennel clearance. Now for the inside of your cab, YES to the GPS and NOAA way to nice to not have , Did you get the upgraded seats with air pump built air lumbar? If not look in to that upgrade captains chairs, Ad the seat saver seat covers there awesome of the wet times and just nice to take them out and put in the washer when ever needed.On the hood! Total decal of “upland nation” with a pheasant in flight just for the sponsors [we don’t need to see it] LOL, cobra model 29 ltd CB for the long drives with other Riggs, Over head console a must when you travel a lot to keep maps ,shades,keys , you name the worlds your oyster right now . I better stop or you’ll be driving my truck almost. Good luck and Good hunting. p.s. more when you get to the RV? Excellent news – if the trailer is that big, I’m way more decadent than I thought. Speaking of toppers, Mike’s idea for a high one is definitely part of the plan but there don’t seem to be a lot of companies that do one that I could stand up in … commercial or otherwise. Anybody out there know of manufacturers? If there is no budget why not do a custom airbrush scene of your pup locked up on some of your favorite upland game birds? Love it! Maybe I shoulda got a long bed – one pheasant, two wires, and maybe the wife’s Corgi. In the cab: GPS; seat covers; rubber floor mats; and a portable NOAA Weather Radio. NOAA only uses 7 frequencies across the entire country and provides up to the minute weather info. In the bed: vault drawer for guns and shells; topper to keep gear dry; Yakima or Thule rack for the boat on top; Reese hitch. Good stuff! Especially the weather radio – thanks. Scott, how do you plan to use the truck? Just to drive from hunting lodge to hunting lodge? Will the dogs ride in the back seat or in the bed? Are you going to buy a horse and start doing field trials? It isn’t really big enough for a slide in camper, and limited in pulling power for an RV. I would think you at least want a canopy. In one of your show ads I saw a really nice slide in drawer for guns and gear inside a canopy. That might be a good starting place. Good questions! Yep, 4WD and it will go off road. We already have horses, and no thanks – NAVHDA, NSTRA and AKC hunt tests are plenty! Dogs ride both front and back. I hope to pull a small travel trailer, and yes, a TruckVault is at the top of the list for secure storage.